Karma Thinley Rinpoche wishes all his students a happy Christmas and peace on earth. Lama Jampa Thaye wishes all his students a Buddhist Christmas in the heart. They also send out their best wishes to all Kagyu and Sakya followers worldwide and pray for the long life of our precious Masters, the great guides of our glorious traditions. 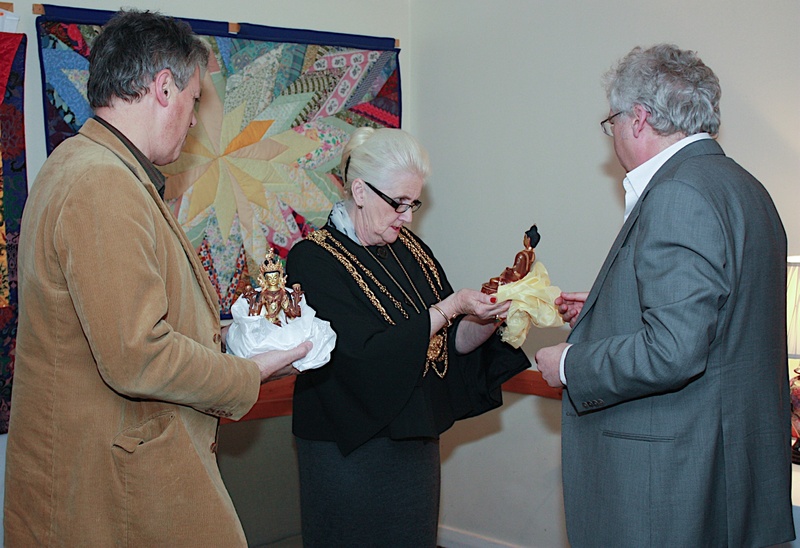 On Tuesday 15 December, Sakya Dechen Ling, Stuttgart, was delighted to host the visit of H.E. 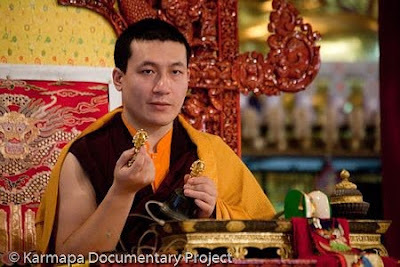 Gyana Vajra Rinpoche, the younger son of H.H. Sakya Trizin. This was not the first visit to Sakya Dechen Ling from a member of the illustrious Khön family, throne holders of the glorious Sakya. H.H. Sakya Trizin’s sister, Her Eminence Sakya Jetsun Kushog Chime Luding Rinpoche, visited in 2008, and now, only a little more than one year later, Sakya Dechen Ling was fortunate to be able to host her nephew, H.E. Gyana Vajra Rinpoche. Sakya Dechen Ling, Stuttgart, was established in 2005 by Lama Jampa Thaye at the request of Wolfgang and Hilde Staufner. The sangha meets regularly to practise meditation and recite prayers, as well as to receive dharma teachings and Vajrayana initiations from Lama Jampa and other visiting Buddhist masters. The shrine room in Sakya Dechen Ling was recently extended by the removal of a partition wall and the incorporation of an adjoining room, providing an increased space for the sangha. At the request of Lama Jampa Thaye, H.E. Gyana Vajra Rinpoche bestowed the initiation of Sangye Menla, Medicine Buddha. 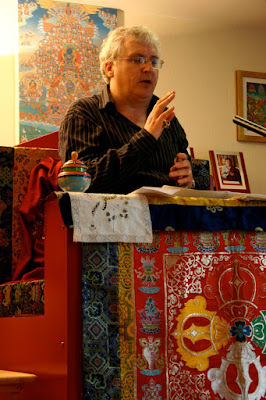 Lama Jampa explained that the practice of Sangye Menla is an effective remedy for physical and mental diseases and also removes obstacles affecting Buddhist practitioners; therefore, it was an ideal teaching for His Eminence to bestow in order to benefit the sangha in Stuttgart and to further the growth of the Buddha Dharma in South Germany. His Eminence expressed his happiness at being able to visit Sakya Dechen Ling and to see Lama Jampa again. His Eminence, accompanied by an attendant monk and Lama Gendun, stayed at the Staufner family home. The party were all amused by the light covering of snow in the area; the attendant monk could not recall having ever seen snow before. Before continuing with his European program, His Eminence enjoyed a visit to the Mercedes car museum in Stuttgart. At the end of the teachings, Lama Jampa Thaye thanked His Eminence for coming to Stuttgart and expressed his happiness that His Eminence would be visiting Dechen centres in the UK in the new year. H.H. Karmapa returned to India in mid-September at the end of his successful European teaching tour. Since then His Holiness has been residing at KIBI in New Delhi. At the end of November he presided over the Kagyu Monlam in Bodghaya and then returned to KIBI for the 20th Anniversary of its founding. Many leading Kagyu masters such as Shamar Rinpoche, Jamgon Kongtrul Rinpoche, Beru Chentze Rinpoche and Mipham Rinpoche were also present at this auspicious event. Please visit here for an account of the Monlam and here for an account of the KIBI celebrations. The Mikyo Dorje Shedra will take place this year on 27-31 December. Lama Jampa Thaye will bestow the “Instructions of the Supreme Siddhas” composed by Situ Tenpe Nyinjay: an account of the stages of practice of Mahamudra and a defence of its validity. The Shedra will conclude with the Initiation of Amitayus. Preparations for the Shedra are well underway and the Kagyu Ling sangha are looking forward to welcoming everyone to Manchester. This year will be different from usual as there is a new venue: the Manchester Conference Centre. Everyone will be able to enjoy delicious food at the restaurant in the venue, as well as relaxing in the lounge where tea and coffee will be available. The Dechen boutique and the Kagyu Ling shop will also be located in the venue. To reserve your place book online here. Lama Jampa Thaye recently appeared on the radio in Manchester where he was asked to provide his "thought for the week" and to discuss a number of stories featured in the newspapers that day. His Holiness Sakya Trizin has been bestowing the initiation cycle "Wangya Norbu Tringwa". This initiation cycle was requested by a number of Gelukpa lamas, including Lama Zopa rinpoche. His Holiness officially opened the Sakya Nunnery Shedra in September. Located in Manduwala, India, the Shedra will initially have twenty nuns in residence. In mid November His Holiness will be going to Lumbini, the birthplace of Lord Buddha in Nepal for the annual Sakya Monlam. This occasion will also celebrate the fiftieth anniversary of His Holiness' accession to the Sakya throne. Further information on His Holiness's recent activities can be found at His Holiness's official website. On Wednesday 28 October Lama Jampa gave an inspiring and moving public talk at ITAM, Mexico City. The following evening, in a slight change to the programme, he gave a 3-hour teaching on Atisha's Precepts at Sakya Dolma Ling. 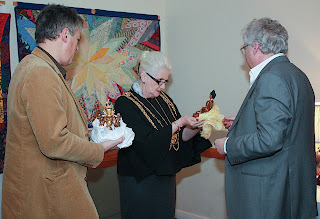 The final event of Lama Jampa’s visit to Mexico was the Initiation and Tri of White Tara of the Wish-Fulfilling Wheel, which Lama Jampa bestowed over the weekend. Everyone was very happy to have received the precious teachings from Lama Jampa during his 10 day visit to Sakya Dolma Ling in Mexico. On Saturday 24 October Lama Jampa Thaye commenced his busy teaching schedule with Geshe Langri Thangpa's Eight Verses of Mind Training and the Initiation of Chenrezik Mahamudra. 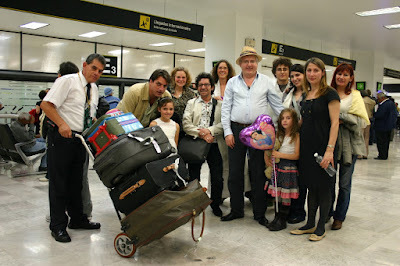 Around 40 people attended these teachings, which were held at a location in the South of Mexico City. The following day, at the beautiful new centre Sakya Dolma Ling, located in the central part of Mexico City, Lama Jampa bestowed the Initiation of White Manjushri, from the lineage of Mati Panchen, and the Initiation of the Sixteen Sthaviras. This auspicious occasion is the first time that Lama Jampa has taught at the new centre, blessing Sakya Dolma Ling and the Mexican sangha. 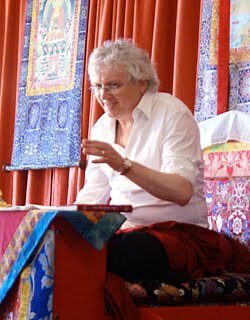 On the Monday Lama Jampa gave individual guidance and instruction to several students who came to see him. Tuesday saw the Mexican launch of Lluvia de Claridad, the Spanish translation of Rain of Clarity, Lama Jampa´s authoritative overview of the Sakya tradition. 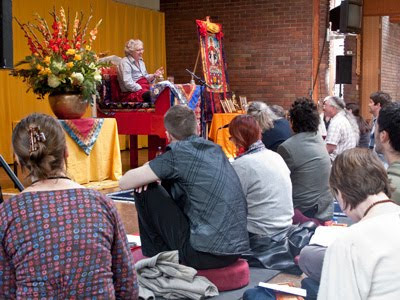 At this event, held in a local bookshop, Lama Jampa gave a detailed analysis of the structure of his work to enable students of the Sakya tradition to gain some understanding of the core tenets of the Sakyapas. During Lama Jampa Thaye's recent visit to Sakya Thinley Rinchen Ling, he gave a couple of interviews to the local radio station. On Saturday 3 October Lama Jampa Thaye taught the third part of Geshe Se Chilbupa’s commentary on the Seven Points of Mind Training. This text is a detailed yet direct account of the mind training teachings of the Kadampas. The third part of the text focused on the importance of cherishing others over oneself and honestly examining one's own conduct. At the end of the teaching Lama Jampa took some time to explain how all the teachings that we receive form part of a structured path and emphasised the importance of understanding, in general terms, the stages on this path. Lama Jampa then walked through the chapter headings of Rain of Clarity, which provides a concise account of this structured path. Understanding this structure is extremely useful preparation for receiving major initiations such as the Kalachakra, which H.H. Sakya Trizin will be bestowing in June 2010. 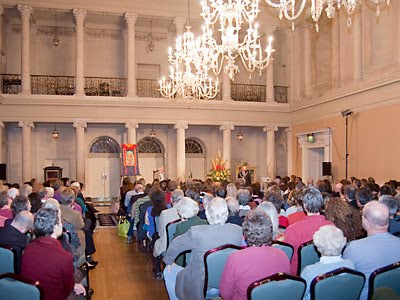 On the evening of Friday 2 October, Lama Jampa spoke to a packed audience in the Bath Assembly Rooms on the topic, Buddhism for Modern Times. The event has firmly placed the Dechen Sakya group in Bath on the Buddhist map. 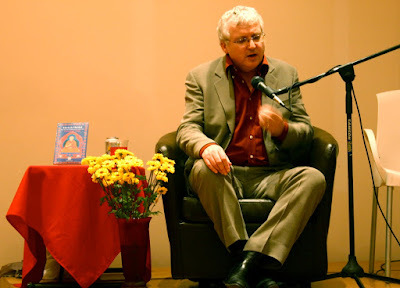 Over 200 people came to listen to Lama Jampa illustrate the vitality of the Buddhist tradition and its extraordinary ability to offer solutions to the most contemporary of modern issues. The Right Worshipful The Mayor of Bath Councillor Colin Barrett closed the evening with a short speech thanking Lama Jampa for his visit. The Annual General Meeting of the European Buddhist Union took place from Thursday 24th- Sunday 27th September. The event was hosted by the Taraloka retreat centre in Wales. Jonathan Macaskill represented Lama Jampa and Dechen and reports back that the conference was busy and successful. European representatives from many different traditions were present and one of the guest speakers was Thrinley Tulku whom Lama Jampa met when visiting Kundrol Ling last month. Recently Lama Jampa talked on the phone with his old friend Lama Jamyang Zopa from His Holiness Sakya Trizin’s phodrang about progress on Sakya Monastery in Kalimpong. The monastery is being established under the direction of His Eminence Ratna Vajra Rinpoche, the eldest son of His Holiness Sakya Trizin. There has been a community of Sakya followers in the Kalimpong area of North Eastern India since 1950, including Tibetans, Sikkimese and Nepalis. As a result His Holiness has entrusted His Eminence Ratna Rinpoche with the project of developing a major Sakya Centre monastery there. Lama Jamyang Zopa who has served His Holiness very faithfully for many years, accompanying him to the West on numerous visits, has been directing the continuing building project there for the last eighteen months. Now Lama Zopa reports that, despite numerous obstacles, four floors of the monastery have been completed and already 150 monks are in residence. The new monastery itself is located very close to the residence of His Holiness Karmapa Thaye Dorje. Recently Lama Jampa talked on the phone with his old friend Lama Jamyang Dzopa from His Holiness Sakya Trizin’s phodrang about progress on Sakya Monastery in Kalimpong. The monastery is being established under the direction of His Eminence Ratna Vajra Rinpoche, the eldest son of His Holiness Sakya Trizin. Lama Jamyang Dzopa who has served His Holiness very faithfully for many years, accompanying him to the West on numerous visits, has been directing the continuing building project there for the last eighteen months. Now Lama Dzopa reports that, despite numerous obstacles, four floors of the monastery have been completed and already 150 monks are in residence. The new monastery itself is located very close to the residence of His Holiness Karmapa Thaye Dorje. On Saturday 19 September, Lama Jampa attended a lunch with Sherab Gyaltsen Rinpoche and Lama Ole Nydhal hosted by the London Diamond Way Centre in Holborn. Sherab Gyaltsen Rinpoche, a distinguished Sikkimese lama, educated under HH Sixteenth Karmapa, and Lama Ole, head of the Diamond Way group of centres, were in London as part of their teaching tour. On this occasion, a pleasant lunch was served, gifts were exchanged and a discussion about the situation of Kagyu dharma in the modern world took place between the three lamas.